Who tops the list as the greatest Giant of all time? 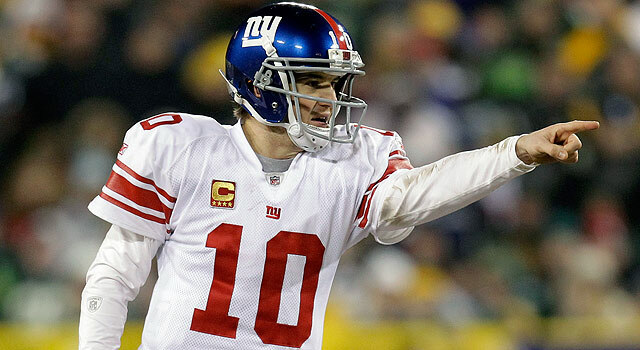 Published: Feb. 3, 2012 at 04:51 p.m.
Is Eli Manning one of the greatest Giants of all time? He's getting close. But you have to remember the Giants are one of the most storied franchises in NFL history. Eli is going to need a little more consistency over his career to break this illustrious list. So here are the six greatest Giants of all time. No team has produced as many dominant linebackers as the Giants, starting with Hein, who was a dominant fixture at center for the Giants in the 1930s and early 1940s, playing all 60 minutes as they did in those games. Hein was as tough as they came, as he never missed a game and only called timeout once -- to fix his broken nose. Simms is best known for being selected as the MVP of Super Bowl XXI when he set a Super Bowl record by completing 22 of 25 passes (and two of those were drops). Coach Bill Parcells called it the greatest game ever played by a quarterback, and he exemplified those Parcells' teams of the 1980s. When the NFL's popularity began to soar in the 1950s, Huff was at the epicenter as the leader of the Giants' defense. The linebacker was on the cover of "Time Magazine" by the time he was 24, and his dominating style of play was encapsulated in the television special, "The Violent World of Sam Huff." Carson was the anchor in the middle of the Giants' defense during the 1980s, and was selected to nine Pro Bowls. He is probably best remembered for recording 20 solo tackles and five assists against the Packers on Monday night in 1982. Gifford was the golden boy of the Giants during the 1950s, and in 1956 he was the NFL's most valuable player as he paced the Giants to a league title. There were many stars on those famed Giants teams, but none brighter than Gifford who could run, pass, catch, play defensive back and return punts and kicks. Taylor is regarded by some as the best player in NFL history, for the way he changed the game. His most exceptional season came in 1986 when he became the first defensive player since 1971 to win the league's MVP award. He recorded 20.5 sacks, 105 tackles and led the Giants to a win in Super Bowl XXI. "Six reunions we can do without..."